Join Calvinist Batman as he brings on a guest each episode and talks about a different cultural and/or theological issue. The guests cover a wide range. Some are popular conference speakers and well-known pastors and others are unknowns or anonymous Christians accounts on Twitter. Each guest has deep integrity and brings something unique and valuable to the discussion. Listen as people call in and ask Calvinist Batman and his guests questions by calling 727-228-2278. 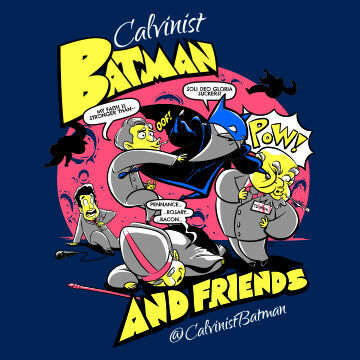 Calvinist Batman's protection extends past Gotham when listening to this podcast. Enjoy! For the next two weeks we will be discussing covenant theology and its alternatives. This week, Dr R Scott Clark joined me to talk about covenant theology and also the reformed identity. He gave me a lot to chew on and I hope he gives you a lot to think on too. SONG: "Holy, Holy, Holy" by Stephen Miller. The Publisher Made Me Do It!